A common theme in sealing pumps is to adapt existing mechanical seals to the application. An example is taking non-cartridge component seals and making them into cartridge seals, or taking single seal designs and placing them in series to create dual seals. This practice can result in a seal design that is not optimized for the intended service. Many industries have come to rely on the guidance of mechanical seal standard American Petroleum Institute (API) 682, which provides qualification standards for reliably sealing the majority of pumps within industrial plants, specifically oil refineries. Like a standardized test in grade school, there is a tendency for mechanical seal manufacturers to “teach to the test,” creating seal models that align with the descriptions and qualification test requirements in the industry standard. This practice becomes problematic when attempting to fit equipment that includes unique seal chamber conditions with a general-duty, API 682-compliant design. There are many pieces of equipment that require seals but are not well-covered by any sealing industry standard. As a result, their needs can be overlooked. Examples of plant specialty equipment include screw conveyers; blenders, mixers and agitators; rotary valves; and vertical sump pumps. This challenge affects vertical sump pump applications, which have a distinct seal chamber environment compared to its pumping peers. The vertical sump pump is found throughout industrial plants in open and closed sumps. Because these pumps feature side discharges to transport pumped fluid, the shaft column is effectively dry, with only some liquid lubrication for line shaft bearings. The seal chamber, which is near the mounting plate, creates the vapor-proof seal when the pump is installed in closed sumps. The vertical sump pump is described in the oil and gas standard for pumps, API 610, where it is given the designation of pump type VS4. It is notable that there is no API 682 qualification test that duplicates the dry sealing environment in these pumps, and API 682 provides no specific guidance to applying seals in VS4 pumps. This makes API 682 qualification status largely immaterial for demonstrating suitability for these pumps. Pumps installed in open sumps have little need for a vapor-tight seal about the pump shaft, but closed sumps often contain dangerous vapors that cannot be permitted to vent into the atmosphere. The most basic sealing options include lip seals and packing, which may be optionally purged with nitrogen gas to reduce emissions. Performance can be further improved with a dry running containment mechanical seal. The highest level of emissions prevention is attained only with a dual pressurized mechanical seal. These can operate on either gas or liquid barrier fluid. The vertical sump pump situation is representative of a larger group of low-pressure, dry seal chamber applications, which require either zero process emissions or mechanical seals supported by an external fluid. With dry seal chambers, the natural solution is to apply a dry running gas seal; however, because this equipment has historically been sealed with lip seals or packing, the area available for the seal is normally confined, making it difficult to apply traditional dual seals. In order to create a more compact solution, a seal manufacturer partnered with a leading manufacturer of porous media air bearings for the precision machine tool, semiconductor and metrology industries. Although the traditional application of porous media technology was as a bearing surface, the technology is suitable for use as a seal face surface. Image 1. Acid duty sump pump with porous media gas seal installed. 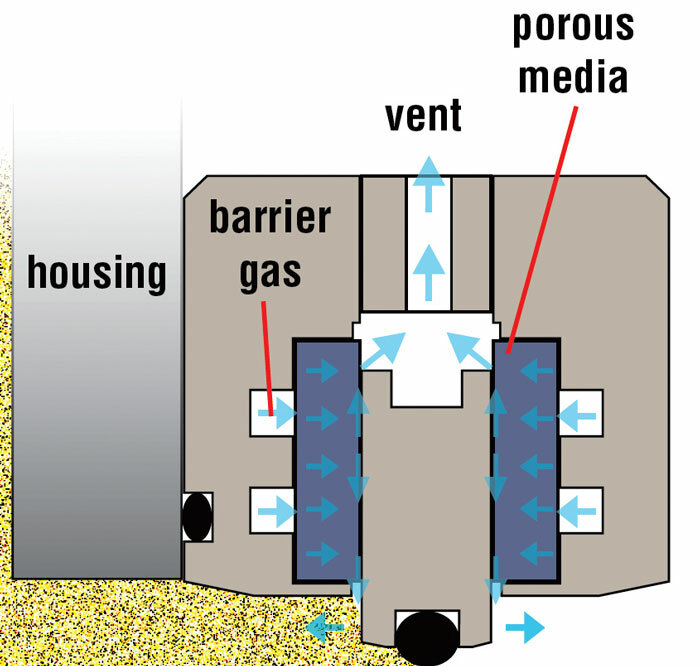 Porous media works by directly injecting a barrier gas into the sealing interface through a ring of porous carbon. Traditional gas seals pump gas across the sealing interface from the inner or outer diameter. By directly injecting barrier gas into the sealing interface, it becomes possible to create a true zero-emissions seal with a single pair of seal faces. This achieves dual-seal performance in a single seal, which reduces the seal’s overall size. The first mechanical seal created using porous media technology has two sets of seal faces which locate and align the rotor. The inner seal faces alone create the zero-emissions seal. These seals operate on a thin film of gas without contact or wear, making them exceptionally reliable. By eliminating the complication of flexible springs or metal bellows, the seal maintains a short axial length, typically less than two inches (50 mm), regardless of the shaft size. Additionally, porous media enables the seal to handle reverse rotation, which can occur when a pump is unexpectedly shut down. 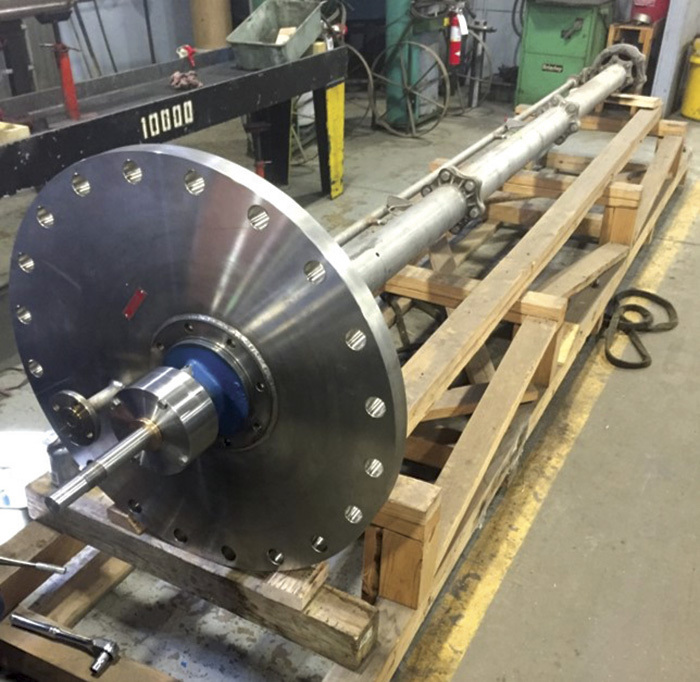 Pumping acid in a chemical plant proved to be an ideal application for the porous media gas seal. The chemcial plant was using nitrogen-purged packing, but continued to experience downtime because of packing failures approximately every nine to 12 months.